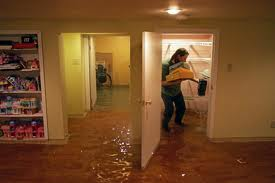 Flooding in basements can be a problem. Basements are primarily used for storage and are often left unattended for days. This gives water an opportunity to get in and go unnoticed for stretches of time. It’s during this time that many possessions are getting damaged by water. Basements can flood for many reasons. Water can enter through cracks in basement walls. This happens most often when there are high amounts of water seeping into the ground outside during periods of raining and snow melting. There are home improvements that can be made to the outside of the house, such as replacing or adding gutters to draw the rain away from the basement. Some may want to consider options such as sump pumps or other products that can be used to seal off any potential problem areas. Getting professional help for the situation is also an option.